In a lot of organizations I work with, we need to do a better job of explaining Scrum to the middle managers. Most of the people in the Teams get Scrum and see benefits. Most of the senior guys see their metrics get better, and, if they focus on the right feedback, hear and see good things. But often the middle managers feel left out. Yes, they see benefits here and there, but often not for themselves. They should actually see benefits for themselves, but no one shows them how to realize those benefits. We just assume they will naturally, without any explanation, understand and adapt to, the change (to Scrum). But, a common feeling among the middle managers is: 'Who moved my cheese?' (If you know that book.) Meaning: Before, I knew how to manage and be successful and show progress. Now, with Scrum, they moved all my levers. And how do I function successfully? So, we need to take the time to explain it to them. Here is a first, too quick, pass at that explanation. It is too simplistic, and too specific in assuming a prior waterfall process. But, a good start (I hope). 1. Your job has gotten better (not stupid). Instead of doing something stupid (trying to manage individuals in a waterfall process), you now help teams get better in a more effective approach/framework (Scrum). 2. Your job has gotten better (clearly useful). Instead of trying to show in waterfall that you did something truly useful (almost impossible to show, really), you now can see real progress in the success of the Scrum team. And working product (software) is a far better measure of real progress. As is team velocity. 3. Your job is different (remove impediments). Instead of pushing the team to 'work harder', you now are a servant leader. Your main job is to help the team remove impediments. Honestly, most of you removed impediments before. You just didn't call them that. And there was no clear way to prioritize them. Now, you get help from the team and more recognition (up and down). For some of you, you get to join a Scrum team and lead the team in doing 'real work'. Which in general is more satisfying for most people. But for those of you who like the frustrating work of removing impediments, we have a clear, prioritized, long list of them. For you to help fix. 4. Your job is different (no command-and-control). In almost all cases, we do not recommend the command-and-control style any more. OK, maybe at most 1-in-20 of the guys in our shop are really lazy or fundamentally without good motivation. Yes, you can help re-purpose (ultimately, fire) those very few people. And you can identify those people who also appear to be de-motivated, and help them get through the past de-motivators we had around here, and connect to work they really want to do. But mostly we want you to take the coaching, servant leader style with the team. You will find that the coaching style is much more satisfying than the command-and-control style. And the people you work with will now mostly like you and appreciate your efforts to make help them better. Instead of ducking-and-diving to avoid you. With both the people below you and the people above you (well, we want to start moving away from the hierarchy metaphor, to a more flat organization, but for now....)...for both sides, the good news is everyone is talking the truth more. This is much more satisfying. Although, to be honest, in the short-term, and until we get more people understanding it, it can be painful and take more courage. But in the long-term, it is better for everyone, including you, if we are all more honest. Our work of new product development is truly hard. We, of course, make lots of mistakes. (As all scientists who discover a new thing do.) We are trying as hard as we can to learn as fast as possible from our mistakes. None of us is perfect. Each of us tends to have a typical, repetitive weakness (and, the good news: we now have a team that helps each of us avoid our own peculiar weakness(es)). There is nothing particularly new about this; it was true in waterfall really. But we are now going to admit it more, top to bottom (as we say). Because we will be more successful as a firm with this approach (Scrum...or at least so we fully expect), we will be more profitable as a firm. And so, your prospects for long-term career growth are better. This is a start on what to explain to the middle managers. Even at the high level, we have left out a lot. Then the middle managers start to ask: OK, what do I specifically do? While some of the specifics will indeed be very specific to your organization, we can say more on that. And will in a future post. PS. The excellent cartoon is by Mike Baldwin. Google him. Great post. The reaction I get is "I don’t feel so good – I’m a people manager in an Agile organization". 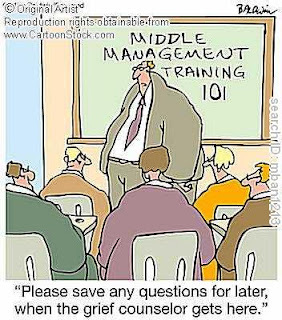 I think one of the biggest problems is not just explaining Agile techniques to middle management but also those that understand it will realise that 1) significantly less middle management may be required 2) With the development team being empowered it can really can highlight the difference in abilities of the once middle manager (now Product Owner) 3) Career progression stops in the way it used to... a successful middle manager won't get responsibility for more and more engineers as their careers progress. Career progression is purely a measurement of efficiency. Umm. I think the ability to deal with people issues is quite important. As are technical skills. And of course, a lot of others as well. 1. Less. Well, often, but not always. And I think there can ALWAYS be reasons to have people in the middle. And these middle people can be very very good. Maybe they are not 'managers' per se, but they can contribute a lot. 2. Differences between whom and whom? 3. Yes, career progression can definitely start to be different. I would say success and progression should be based on delivering business value with speed (and of course quality). No offense, but I see your entire article as very naive. It seems to assume that all people have the same skills and desires. Let’s take it from the perspective of the manager. He likely got to his position because he was good a command and control. Even if he wasn’t a micro-manager he probably enjoyed being involved in the decision making process. He probably also thinks that he is better at making these kind of decision than those on the team. Now, we no longer value what you enjoy doing and are good but since it helps the organization you should enjoy it. Furthermore, probably the IT deparment decided they are going to do agile. The manager still feel that it is his team. The rest of the company probably also shares this view as not everything went agile. Now the manager is sitting in management meetings but cannot contribute in the way that any of his peer manager can contribute in terms of adjusting plans, making commitments, etc. But he is supposed to like it. You acknowledge that the career paths have probably changed but you don’t offer any real alternative to this manager on what it is likely to be. He likely doesn’t have a clue and over time he will get less and less credit for the successes of the team. His boss sees this too…he says I have 5 self managing teams, what exactly are all of these other managers doing? Seems like a lot of solitary. The boss get credit for making the organization more efficient the middle manager will not (because after the initial implementation he isn’t contributing much to that efficiency). The middle manager gets canned. So what is in it for him? Better titles – No, More Money – No, More Challenge (partially but only because he now is focused on stuff he isn’t good at and doesn’t like), Job Stability – Ha! Sure some prefer to coach and being a servant to the team but in my experience this is the dramatic minority. Naive? Well, I don't think I am. But I can agree that the blog post does not cover the whole subject. It is, I think we can agree, barely a start. So, the first thing I will say is that your situations seem realistic to me. AND...they are not all the situations that I find in companies. There are many different situations. More specifically: On your first 2 paragraphs, I think what you describe --can be-- exactly how a specific middle manager can feel. 3rd Paragraph: Yes. We need more time/space to discuss the new career path in more detail. That blog post was not enough. And I agree that some middle managers can be fired (often wrongly) because more senior managers do not see how they will contribute. Again, a reason to talk about the new role of middle managers, rather than to be silent about it. Titles - Well, I never knew anyone I respected to care much about those. Money - Actually, since the Team(s) should be more successful, there should be more money as bonus to distribute. So, I think the middle manager, assuming he/she is making a contribution, should see this as a Plus. More challenge - Actually, I see this as a Plus. I think many middle managers are actually quite good at removing impediments. Scrum makes it easier and better. 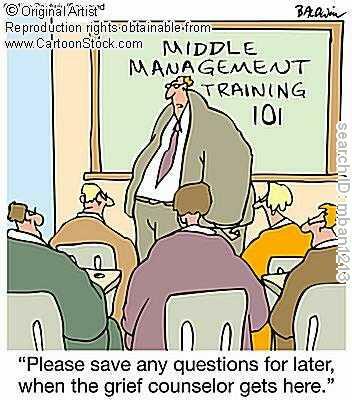 But not all middle managers are; you are correct there. If they only thing they are good at is command and control, and not interested in changing, then you are right, basically. Job Stability - Ummm. Well, often we must produce a good/better product faster than our competition. Scrum greatly improves your chances of doing that. So, a plus. But, if you were actually not contributing much or can't do it in a Scrum context...well, then you will be re-deployed to a different firm sooner. Maybe a good thing for you (the middle manager). In a Scrum transition I just coached, we bypassed middle managers ("project leads"), and successfully turned senior developers and architects into ScrumMasters. We gave the displaced middle managers new jobs that would benefit from their knowledge of the organization and domain: resource and workload balancing, risk analysis, recruiting, impediment removal, and supervision of lights-on work. We gave them enough training on Scrum to show where their new roles will fit. There was a period of adjustment and patient coaching (the techs formerly reported to the middle managers, who had to become chickens in all Scrum meetings). The middle managers are now contributing well. As a factual matter, what you said is similar to what I have seen. I would emphasize more removing impediments, is all. So, I liked your specific suggestions. Which is probably the most important thing. Now, I find that middle managers are (or were) some of our best people. Typically. I am a bit concerned that your words can be read this way (maybe exaggerating a bit): "Those jerks who are middle managers can't do much, but we got them re-assigned so that they actually are mostly positive around here." In other words, the words might be read as disrespectful. Now, having seen some bad middle managers in my day, maybe some disrespect is deserved. But on the whole, I like to start with respect. Again, not sure that is what you meant [disrespect] (I think in fact you did not), but I think some could read it that way. Which I think does not usually help. No disrespect. Just that we wanted ScrumMasters with hands-on object-oriented development experience. Makes sense. As I said, I did not think you meant disrespect. Still, I find too many people in Agile feel disrespectful of middle managers. My view is that some middle managers are 'worthy' of disrespect, but far far from all. And too many good middle managers think Scrum gives them no decent role. Now, part of this is 'talk' they hear and part is lack of discussion (of their new role). Because I think good servant leaders have plenty to do in Scrum. 1) Do you see more Agile/Scrum implementations closer to Anderw's approach (TL's and sr devs being moved to SM roles) or moving current project leads/project managers into SM roles? 2) Which have you found more effective? 3) How do you see the sourcing of the role of the Scrum Master evolving as the Agile/Scrum/SM role matures? Joe, Scrum seems to assign the teams are self organized. It will start well as self organized team, during the stressful times it breaks. 'Middle managers' in the scrum have influence and not control. They can fix in time, but immediate deliveries will suffer. In that phase, there will be a huge urge to go back to 'command and control'. Yes, sometimes the self-org "breaks" as you say, or does not work. And a good manager does not just watch them fail. Depending on the situation, he or she might have to intervene some. Or a while. Remembering that people are free. And creative people (you do have those kind, right? ), creative people especially must be free. To do good work. "People are remarkably good at doing what they want to do." And, deep down, they want to be free, to control their destiny. But the bigger problem is the middle-managers have been taught, trained and seduced into command-and-control. They have been lied to and told, in effect, "these people are you slaves." And there is only one thing to say about this: It is wrong! It is against the dignity of any human being. We can also say that in the long term it does not work. Human welfare progresses to the degree that people have, and use properly, more freedom.